There's an unappreciated art to adventure game backgrounds. They need to be pleasant backdrops to walk in front of multiple times while you're trying to figure out what to do with the custard and the octopus, yet they also need to stand up to the rigorous attention of players hunting for a hotspot because there's a vital clue hidden in that long grass (it's a tiny snake scale, of course). Maybe that's why these environments stick with us. All it takes is a glimpse of the carnival America of Sam & Max: Hit the Road or the imposing Ankh-Morpork buildings of Discworld to take me right back to playing those games. Ben Chandler is an expert on the subject, having served as artist and animator for Wadjet Eye adventure games like The Shivah: Kosher Edition and Technobabylon. He also wrote a blog about art and composition, and last year we called on his expertise in assembling a gallery of gorgeous adventure game scenes from the pixel art era. Now it's time to celebrate his own work on Wadjet's latest game, Unavowed. 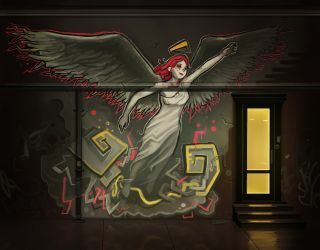 An urban fantasy story set in New York, where a secret society protects the world from various supernatural evils, Unavowed brings some new ideas to the genre. There are four companions with their own abilities, a customisable protagonist, and pop-up descriptions that appear at mouseover so you don't have to right-click to look at every single thing. But Unavowed is still a classic point-and-click, as this collection of backgrounds shows. From its Chinatown streets to a dive bar and a spooky basement, these are all places that immediately look like they're worth waggling a mouse cursor over. Click the top-right of each image to embiggen them.